For those adventurous holiday takers who yearn to explore the unfathomed streams and natural horizons of the dense greens on earth, the jungle safari awaits you! 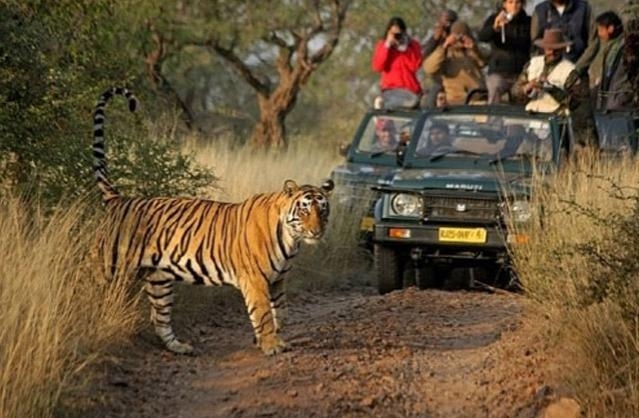 The jungle safari gives the nature lovers a chance to explore the wildlife amidst the scenic beauty. Dandeli Jungle Safari is a thrilling adventure which entails travelling through a dense stretch of lush greens for approximately 14 km. Whilst on travel you get to witness the natures’ gift, wildlife habitats and animals like Bison, squirrels, foxes, etc. In Dandeli, homestay is available for those who are looking on accommodation on a budget. If you don’t want to stay in one of the cozy cottages, then you can think of staying in a tent or camp in the jungle. We provide tasty and wholesome food for all our visitors. Dandeli is a small town nestled in the heart of the Western Ghats. This mountain town lies in the fringes of a tiger reserve area and is home to some of the rarest birds in the country. Plus, the River Kali that flows in this area brings with it, its own unique beauty, calmness, and lots of fun. This small town is situated about 500 kilometers from the capital of Karnataka. You can drive down to Dandeli from Bangalore. If you want to take the flight, then the nearest airport is Hubli. You can fly down to Hubli and then arrange for local transport to the Dandeli Jungle Resorts. Instead of just booking in a Dandeli homestay, you could also book one of our special packages. These packages include a plethora of activities, sightseeing trips, and loads of fun elements. white river rafting at Dandeli. You can also go on a jungle safari in Dandeli. Who knows, you could be one of the lucky few who get to spot a tiger or follow animal footprints to check their location? Take a break and rejuvenate your spirt in the beautiful surroundings of Dandeli. As you set your tour of the natures’ best, there are a number of things that you should take into consideration so as not to disturb the natural beauty and habitat. As you set out on your Dandeli jungle camp trip, listed below are a few things that should be a part of your camping accompaniment. It is certainly a good idea to wear long pants for fear of any insect bites or scratches from the weeds. If you are planning the Dandeli jungle camp during the winters, it is ideal to wear layers to clothing to keep you warm. As you embark upon the most thrilling adventure, keep in mind the above factors. They can help make your trip a pleasurable and memorable one!